We try to buy the best of our favorite style, Art Nouveau. This figural lamp is a real little gem. Artist-signed A. Fery and we believe it was done circa 1900. The base on which this lovely gal stands is the epitome of the beauty of Art Nouveau. This is a graceful and luscious example of top grade Art Nouveau. It came to us without any shade, and we found what we feel is a nice match considering size, color, age, and overall look. Signed under the left shoulder: ”CerNelille”. 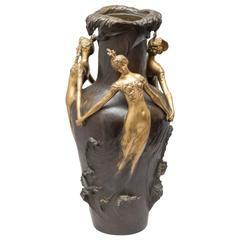 A large Art Nouveau bronze Can Can Girl lamp with shades signed. An absolutely stunning bronze of a dancer balancing two milk glass shades each taking one sixty watt bulb.